Our local South Florida farmer's markets are currently featuring homegrown produce - zucchini, green beans, Swiss chard, tomatoes to name a few. It's also prime time for picking tomatoes and strawberries. Not a bad deal, really - especially since folks in other parts of the US are still shoveling snow. I bought all of the above in an effort to make and share some recipes suitable for Lent. I've already posted the Swiss chard and white bean soup recipe, so today I've got a grilled zucchini recipe. This recipe is adapted from one I found in the Whole Foods recipe collection. It's not necessarily Armenian, but it definitely qualifies to serve during Lenten - or - whenever. 1. In a blender or food processor, process olives, vinegar, pepper, water, and 1 Tbsp. of the olive oil. Blend until smooth. Add more water if mixture is too thick. Set aside. 2. Place zucchini slices in a large bowl; toss with lemon juice, the remaining 2 Tbsp. olive oil, and a dash of salt and pepper until well-coated. The zucchini can be grilled on a stove-top grill pan, in a counter-top grill, or on an outdoor gas or electric grill. Set grill on a medium-high setting. 3. Cook until grill marks appear on zucchini, and zucchini becomes tender – about 3 to 4 minutes on each side. 4. 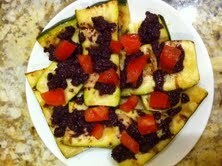 Layer zucchini slices on platter; drizzle each layer with Kalamata vinaigrette, and garnish with chopped tomatoes.